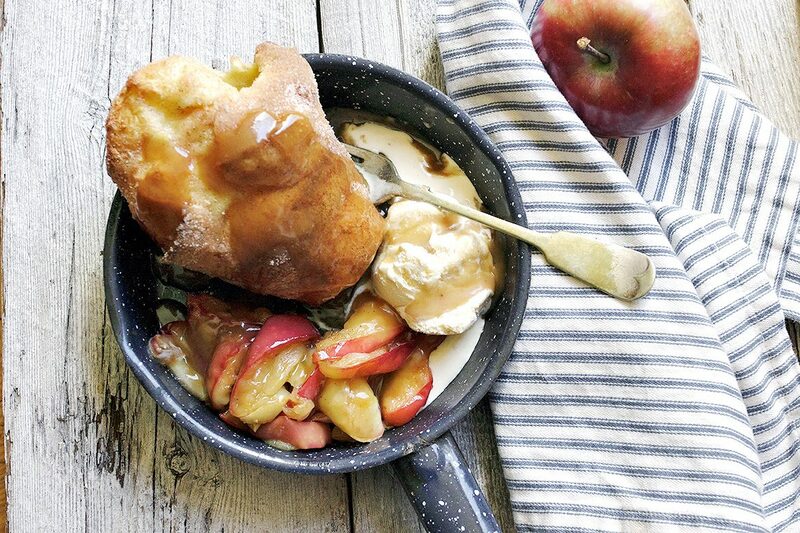 Delicious Cider Caramel Apple Popover Skillet, full of Fall flavours, with sauteed apples, cinnamon sugar popovers, ice cream and a delicious warm cider caramel sauce. 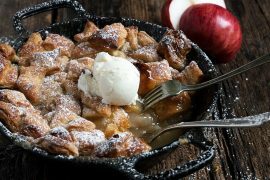 This Cider Caramel Apple Popover Skillet is just a fun Fall dessert, perfect for sharing on a cool evening! 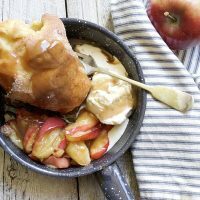 It is a great combination of Fall flavours, with sauteed, caramelized apples, ice cream, a cinnamon sugar popover and a delicious warm cider caramel sauce! This dessert is nice served in small skillets or any shallow bowl would work just fine. Don’t have a popover pan? Make smaller popovers in metal muffin tins. The recipe will make about 8 smaller, muffin-tin-sized popovers. The best strategy is to fill only 4 of 6 cups in two 6-cup muffin tins, to allow some room for the popovers to expand. You can make all elements of this dessert ahead! The popovers can be made several hours ahead, as well as the sauteed apples. The sauce can be made a day or two ahead. Simply re-warm the sauce slightly, maybe the apples a bit too, then serve with the popover and a scoop of ice cream. Delicious and fun Fall dessert skillet! 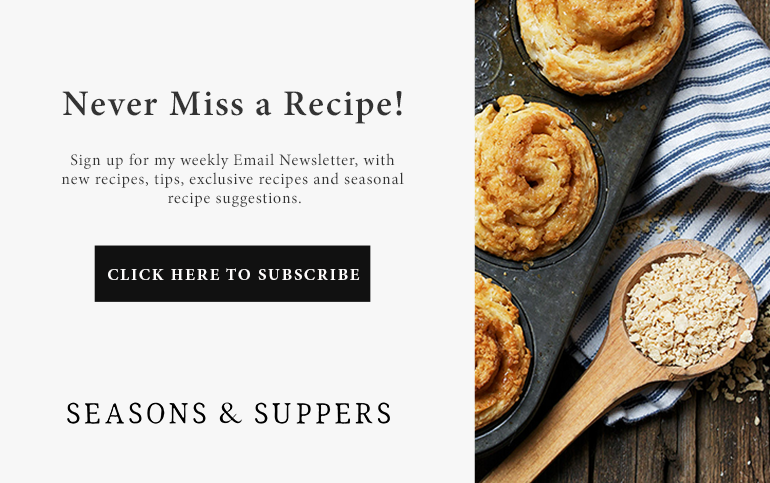 Make the popovers in a popover pan or a muffin tin. 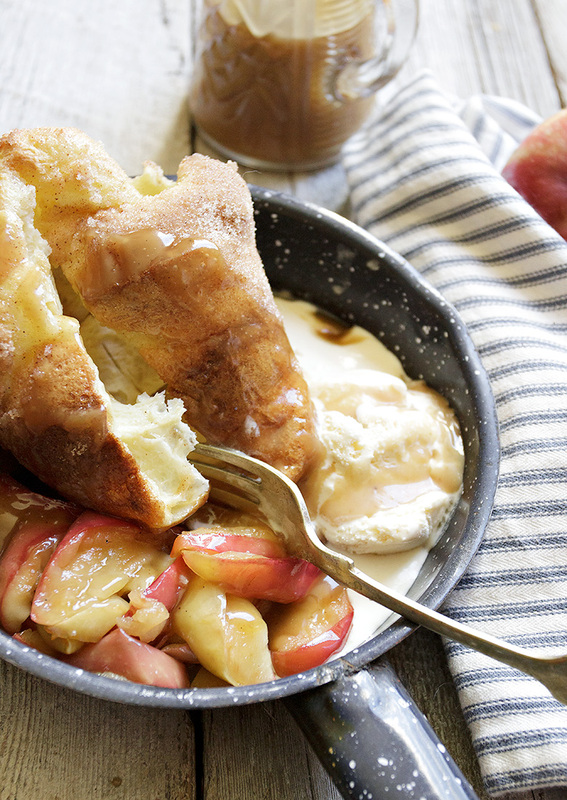 Both the popovers and the cider caramel sauce can be make ahead. For the Caramel Sauce: In a small saucepan, bring cider to a boil over medium-high heat. Reduce heat to medium-low and simmer until reduced to 1/3 cup (about 10 minutes.) Add brown sugar, butter and cream and stir to combine. Continue to simmer until sauce thickens (will thicken further as it cools). 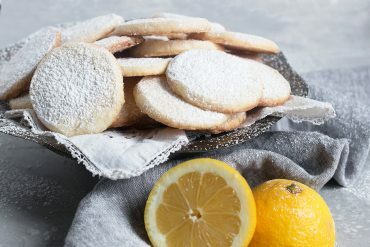 Stir in vanilla and salt. 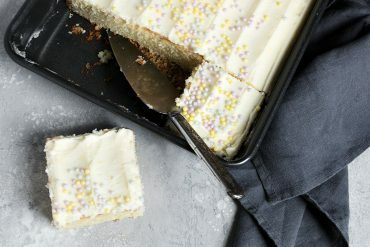 Cover and refrigerate until needed. *If sauce is too thin, stir in and cook 1 tsp. cornstarch combined with 2 tsp. cream). Re-warm slightly to serve. For the Popovers: Combine the eggs, milk, flour, melted butter and vanilla in a blender and blend until smooth and foamy. Let batter rest in blender for 30 minutes. Preheat oven to 450 F. with rack in second to lowest position and with no rack immediately above it (as the popovers will rise!). Place popover pan or 2 6-cup muffin tins in oven to heat as the oven preheats. Once batter has rested, give it a quick blend to re-combine. Carefully remove popover or muffin tins from oven and quickly spray with baking spray. Pour batter in to hot pans, filling about 2/3 full (should make 6 popovers or 8 muffin-tin-sized popovers). Place back in to 450 F. oven and bake for 20 minutes. After 20 minutes, DO NOT OPEN OVEN, but reduce heat to 350 F. and continue baking until popovers are golden, about 15 minutes more. Remove popovers from the oven and turn out on to a cooling rack (may need to run a knife around the edges). Immediate cut a slit in the bottom of the popovers to allow steam to escape (prevents soggy insides) and allow to cool. Once cool, brush each popover with melted butter, then roll/sprinkle with cinnamon/sugar mixture. For the Sauteed Apples: Melt butter in skillet over medium-heat. Add apples and sprinkle with white sugar. Stir to combine. 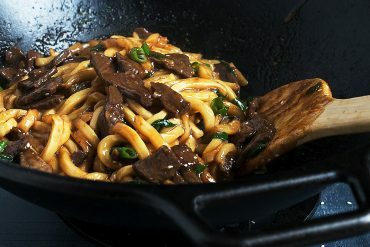 Increase heat to medium-high and cook, stirring, until soft and golden in spots. To serve: Divide sauteed apples among serving dishes. Place a cinnamon sugar popover next to it, along with a scoop of ice cream. 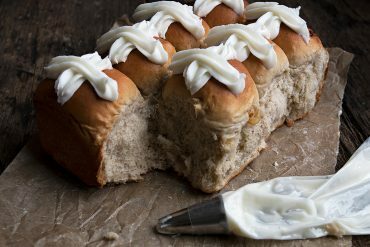 Drizzle it all with some of the Cider Caramel Sauce. Enjoy! All the flavors melded well together. My caramel sauce needed a little thickening so made half of the slurry and it was perfect. I would recommend warming the popovers up in the oven and then I cut the top off and put the ice cream and a little caramel sauce inside reseated the lid and topped with more sauce and the warm apples. Delicious!!!! A great way to end a fall dinner. So glad you enjoyed it, Cathy and I love your idea of putting the ice cream inside. I wanted to do that, too, but didn’t just for photography reasons. It’s a great way to eat it, though, for sure! how much fun are popovers? i serve them for fancy dinners and sometimes on Thanksgiving. So smart to tuck them into these sweet skillets. 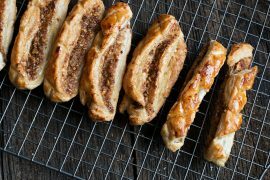 and yes, yes, yes to that cinnamon sugar topping! I can’t get over how awesome this looks, I’ve only had savory pop overs before but clearly I need to make this version! Thanks Sara and yes, you must try sweet popovers. Delicious! Oh wow, you are seriously the skillet queen, Jennifer! 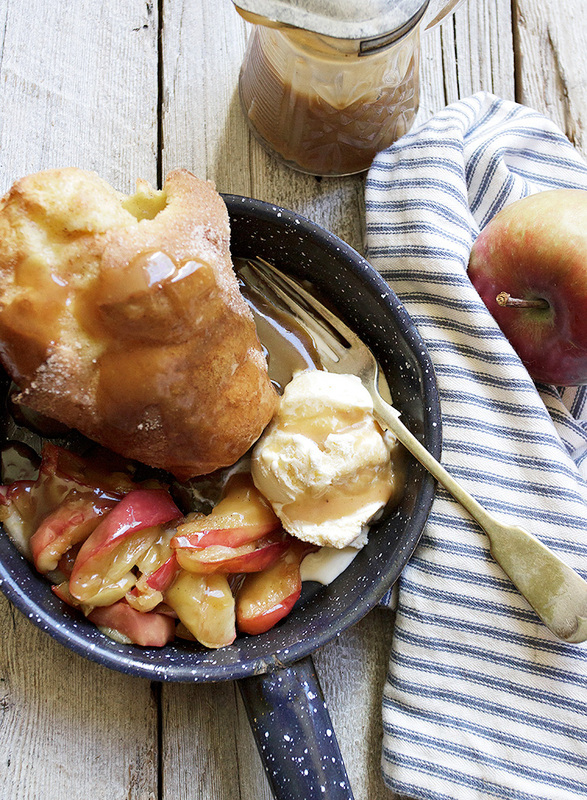 This Cider Caramel Apple Popover Skillet looks like sweet perfection! Love all the flavors in here! I’m seriously contemplating skiping dinner and heading straight to dessert with this! Cheers! Thanks Cheyanne :) I am thoroughly convinced that absolutely everything tastes better in a skillet! This is so creative, I have never thought to make sweet popovers but why not?!! They look wonderful with the sauce and ice cream and apples – I could skip dinner and go straight on to dessert. A beautiful combination Jennifer. Thanks Tricia and yes, you should try sweet popovers. I love these cinnamon sugar ones! Oh my goodness, bring it on! If I ever have a choice of desserts at a restaurant, it’s always the warm apple one that wins my heart. This one looks wonderful and definitely like the types I would choose! Add a scoop of vanilla ice cream and I’m over the top! I don’t eat a lot of apples but I absolutely love them in desserts. 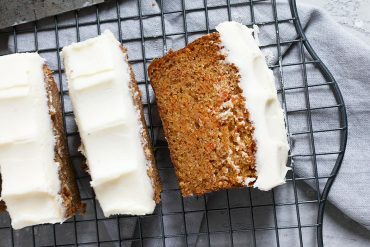 All the elements of this recipe make it the perfect autumn recipe for me! Thanks Mariana :) It really did taste like Fall! What a comforting, cozy dish Jennifer! Popovers are a favorite of mine! The apples and that caramel sauce sound heavenly! Thanks Mary Ann. I love popovers, too, but I’ve only ever really enjoyed them plain. I loved them with the sauce, especially! This is such a unique way to enjoy popovers! This sounds SO good! Thanks Katrina :) It’s a fun Fall dessert!